Birdland is situated in the heart of the Cotswolds in the picturesque village of Bourton on the Water. It is set in woodland and gardens covering about 7 acres, around the River Windrush, which also flows through the village. It originally opened in 1957 in the centre of the village and moved to it's current site in 1989 which was originally a Trout Farm and Poplar plantation. Over 150 trees still exist on the site and provide a canopy for the River and enclosures. It is home to over 500 birds from around the world, including flamingos, pelicans, penguins, cranes, storks and waterfowl which can be seen on various aspects of the water habitat. But there are also some 50 aviaries which contain many other species of bird including parrots, falcons, pheasants, hornbills, toucans, pigeons, ibis and more. The Desert House is an indoor habitat with very spares planting and it houses 10 different species of birds that live in or near to desert environments. It is not a walk through area, but one that is viewed from one end and has such species as the Desert Finch and the Carmine Bee-Eater. Toucan House - originally the temperate house and made the right environment for these birds. Marshmouth Nature Walk - a new area opened in 2010. Two and a half acres of marshland, pond, meadow, copse with hides by the river and at various bird feeding stations. 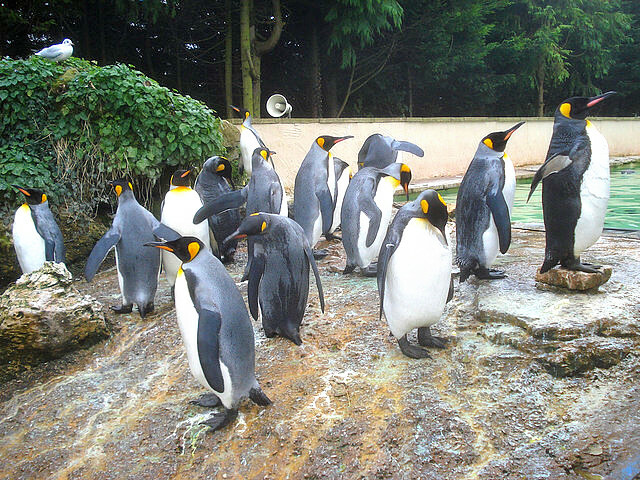 Birdland is also home to the only collection of King Penguins in England, and both these and their other resident Penguins, the Humbold, are fed at 2.30pm each day. In its 7 acres there are landscaped areas of parks and lakes with 3 outdoor and 1 covered picnic areas scattered around, there is water habitat for some of the wildfowl and you will find flamingos in the gardens. During the period Easter to October there are also Bird of Prey encounter days and reptile awareness talks put on, but check out their website or call them to check when these are available. There is also a children's playground for them to burn off more energy, a cafe and gift shop. Getting there: Bourton on the Water is off the A429 between Stow on the Wold and Northleach. There is a public car park near the entrance to Birdland, but also a much larger one in the centre of the village and Birdland is only a 5 minute walk from here. Access: Easy access throughout the whole site. Opening Times: Open all year except Xmas Day. Apr-Oct 10am-6pm; Nov-Mar 10am-4pm. Family (2+2) £19.80. Season tickets also available - see website for details. Notes: Dogs are allowed on site, but must be kept on a lead at all times.